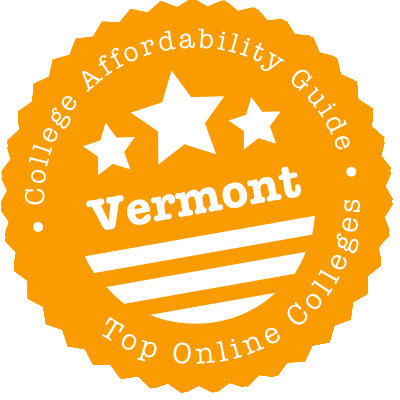 Scroll down to see the top not-for-profit colleges and universities in Vermont offering online degree programs. For students seeking online degrees, Champlain College offers 13 bachelor's degrees in accounting, business management, health care administration, integrated studies, computer & information systems, health I.T., management information systems, software development, web design & development, computer forensics, cybersecurity, economic crime investigation, and health care administration as well as four graduate degrees including an M.B.A., an M.S. in Digital Forensic Science, a M.S. in Executive Leadership, and an M.S. in Health Care Administration. Financial aid is available for degree-seeking students taking online classes. Students can take courses in 15-week spring and fall semesters beginning in January and August, 7-week semesters beginning in January, March, August, and October, a 12-week summer semester beginning in May, and/or 7-week semesters beginning in May and July. Students taking online courses can log in whenever it is convenient--24 hours a day, seven days a week--to complete coursework. Students may receive transfer credit for previous courses taken at colleges or universities or in some cases, work-life experience such as professional training that may have college credit equivalency. Norwich University offers five bachelor's degrees and ten Master's degrees: a Bachelor of Interdisciplinary Studies, a Bachelor of Science in Criminal Justice, a Bachelor of Science in Cyber Security, a Bachelor of Science in Management Studies, a Bachelor of Science in Strategic Studies and Defense Analysis, a Master of Arts in Diplomacy, a Master of Arts in History, a Master of Arts in International Relations, and a Master of Arts in Military History. Additionally, Norwich University offers certificates and enrichment opportunities. Classes begin on January, February, May, June, September, and October, and online classes are well suited for working students or students with busy lifestyles as coursework can be completed whenever it is convenient. There are still deadlines and exam dates, however, and there is an optional week-long residency on campus. Financial aid may be available to online students who qualify, and students who have received credits at other schools may be able to transfer credits into the new program. The Community College of Vermont is the second largest college in the state, and most students live in Vermont. However, with its online offerings, students located just about anywhere can earn an associate degree or a certificate in a range of subjects. Online associate degrees all have a transfer option but they don't neglect hands-on skills. For example, the Associate of Science in Computer Systems Management prepares students to take the exams for the CompTIA A+ and Network+ certifications. Other online degrees include accounting, criminal justice, and early childhood education. CCV recently introduced accelerated classes that allow students to complete some courses in seven weeks. The college also gives credit for prior learning to help students earn their degree faster. The university has an online RN to BSN program and offers three graduate degrees online - Master of Public Health, Master of Science, Leadership for Sustainability and an Accelerated Master of Public Health Track. There are six online certificate programs: Certificate of Graduate Study in Environmental Public Health, Certificate of Graduate Study in Public Health, Contract Courses for Educators, Digital Marketing Fundamental Professional Certificate, Food Hub Management Professional Certificate and Professional Actuarial Exam Preparation. The university uses the Blackboard learning management system for instruction and teacher-student communication. Vermont takes distance education seriously, so even though the Green Mountain State isn’t particularly large, you’ll still need help sorting through the online options. This guide gives you a concise rundown of degree paths, accreditation issues and price tags, with a handy list of links at the end. Look at a map of its 12 locations and you’ll see that the Community College of Vermont (CCV) strives to make an associate degree accessible to all Vermonters. Students in the state can take online courses or whole degrees from the Center for Online Learning, then pop into their local academic center for academic support, administrative matters or (if they choose) in-person classes. Thanks to the Vermont Virtual Learning Cooperative (VTVLC), high school students don’t have to worry if a course isn’t offered at their school or if they have a scheduling conflict. They can take all sorts of classes, including Advanced Placement courses that chip away at the credits needed for a postsecondary degree. Secondary students from VTVLC partner schools pay nothing. Plus, VTVLC gives Vermont high school upperclassmen two dual enrollment vouchers, redeemable for free courses at CCV. LyndonFLEX encompasses any course offered in a hybrid or online format as well as night and weekend courses. The JSC in Your Community program combines online and weekend courses at locations throughout the state, while the JSC Online program runs a handful of bachelor’s programs available to out-of-staters at an in-state rate. The Vermont State Colleges get extra points for making it straightforward for such students to garner prior learning credits. Get credit by passing a standardized test, independently mastering a course’s objectives, putting together a winning portfolio, or completing an organizational training. UVM is outside the Vermont State College system, so it keeps its own website for continuing and distance education. Nontraditional students and recent high school grads alike can scroll through degree and course offerings. Not everything is for credit, but even non-degree students can get financial aid from UVM’s Continuing and Distance Education office. The New England Board of Higher Education’s (NEBHE) Tuition Break initiative gives Vermonters a sizable discount for going to a participating school in Connecticut, Maine, Massachusetts, New Hampshire or Rhode Island if they enroll in a program (residential or online) that isn’t available at a public institution back home. Students from those states receive the same courtesy when enrolling in a Vermont program. Vermont is relatively free of shady schools and diploma mills, but prospective students should always be vigilant against diploma mills, the region’s Better Business Bureau warns. Rule #1: If you want your degree to be worth something, avoid online schools that aren’t accredited by an agency recognized by the U.S. Department of Education. Still, it’s not unheard of for the state’s 20+ accredited colleges to run into issues. In 2016, for instance, Burlington College lost its accreditation and shuttered its doors due to financial issues. The New England Association of Schools and Colleges (NEASC) accredits all of Vermont’s colleges and universities, save a few vocational schools that stop at the certificate level. NEASC maintains an updated list of Vermont members on its website. To make sure a school isn’t in danger of going down the same path as Burlington College, browse NEASC’s Recent Commission Actions. Seeing an asterisk next to a school’s name means you should click for more info. Just to be safe, you can cross-check NEASC’s list with the Council for Higher Education Accreditation (CHEA) database. New England Association of Schools and Colleges (NEASC): NEASC’s Commission on Institutions of Higher Education (CIHE) accredits all public institutions of higher learning in Vermont, as well as most private ones. Check there to see if the Vermont schools you’re eyeballing are regionally accredited. Vermont State Colleges System: Flexible degrees. Five schools. All of which link seamlessly to the Vermont State Colleges website. Use it as a jumping off point for your distance education. Vermont Virtual Learning Cooperative (VTVLC): Step 1: Take free online AP courses in high school. Step 2: Score well on the AP exams. Step 3: Get dual credit for high school and college, while lowering your tuition costs. Register at VTVLC. Consortium of Vermont Colleges: The Consortium’s degree search tool doesn’t yet allow you to filter for online degrees, but it can expose you to offerings from Vermont’s public and private schools. Use it to see which institutions have your chosen academic program. New England Board of Higher Education (NEBHE): NEBHE maintains an online database of out-of-state programs that Vermonters and other New Englanders can enroll in at a lower regional rate.